Whatever else owners do to their Minis by way of interior/exterior modifications or none at all, a very large proportion desire and search for an increase in engine performance. Now this may not be super-sonic speed-inducing power, it could just as well be for maximum economy. In either case, it’s the engines volumetric efficiency (VE) under scrutiny - it’s ability to breath in as much correctly proportioned air/fuel mix as possible in any given situation. Although the induction/exhaust system plays an important part, there are effectively two major factors that dictate performance increases - the camshaft and cylinder head. The induction and exhaust elements (stage one kits, exhaust systems, etc.) and camshafts are covered in various other articles in my 'Corner'. So here we’ll have a look at cylinder heads and dispel some of the myths and legends surrounding them. It is a fact that almost any engine will give better performance from a suitably and - in particular - a well-modified head. The key items to note here are ‘suitably’ and ‘well’. There are quite a number of modified heads on the market that will not improve performance at all. The main problem is identifying a good one from a bad one - almost impossible to the untrained eye; particularly as devious would be 'head-sperts' (am I allowed to say that?) employ the ‘sparkly baubles’ (dazzle with brilliance? Or, as an esteemed colleague and friend puts it, 'eye candy') approach, i.e. much polishing and careful painting in bright colours, to attract the eye of the unwary. Techno-babble is added into the equation (baffle with bullsh*t approach), and an endless list of tuning levels (stage 1, 2, 3, 4, 5, etc.etc.). So let us have a methodical look at what goes into a head, modifications employed, applications, and directly associated ancillaries to try and decided what is suitable and beneficial to your particular application. Myths and legends item 1. There are no such things as steel guides. They are actually cast iron. If they were steel the valves would very likely seize in them unless elaborate and expensive materials and heat treatments were employed. And contrary to popular opinion, they are more than capable of dealing with a vast majority of fast road engines with high lift cams and/or rockers, providing chrome stemmed valves are used. They are not suitable for use with stainless steel valves as used in race heads, although I have been playing with the latest breed on nitro-carburised stainless steel valves in iron guides. Jury's still 'out' on this at the moment. There are three designs of cast iron guide. That fitted to the small bore head is basically a straight tube. Next is a slightly longer version with a groove near the top to hold a top-hat type valve stem seal used on large-bore motors, and lastly one with a slightly tapered nose (known as bullet shaped) but otherwise the same as the previous offering. At approximately half the price of the more (falsely) popular ‘bronze’ guides, they make for a reasonable cost saving. ‘Bronze’ guides have become the ones to have/use basically because of ‘old’ technology spilling into modern life. Originally they were made out of stuff called ‘Navy Bronze’, a phosphor-bronze mix that held oil well (kind of self lubricating), were very orangey/copper coloured, and were used in the early days to avoid valve seizure at high rpm when used with 'standard' spec valves before stainless steel came into use. Then they were needed when the first nimonic steels were used (as in AEG163 MK1 S heads). They enjoyed a very long period of use but suffered severly from rapid wear. Technological advances have seen a number of alternatives used, mainly of silicone/brass or manganese/brass bases. There is one type with a high aluminium content (sort of silver-gold looking), then ‘HT20’ which is specially manufactured to a USA developed spec (light gold colour), and manganese/bronze (yellow-brass colour). Without going into full chemical analysis mode, the manganese/bronze is the best all round and used extensively by automotive supremos Mercedes, BMW, and Jaguar to name a few. Myths and legends item 2 - they don’t last longer than iron guides when used with standard material valves. Wear rate is totally down to cam lift and rocker ratio/geometry. For those fitting their own guides, or having them done by a local machine shop, the correct finished reamed size is 9/32” (0.2812”). There isn’t an exact metric equivalent so don’t let ‘em tell you there is! The smaller 7.10mm metric one is 0.0017” smaller (0.2795"), the larger 7.2mm metric one 0.0023” larger (0.2835"). So when 0.0003” (that’s 3/10’s of a thou) makes a difference, you can see one’s too tight, the other too slack!! The valve stem diameter is 0.2795". Of course this is ignoring specially made/sized reamers…Having said all that - there are one or two head modifiers who are either using worn out or specially made reamers to achieve tighter running clearances. Apparently to achieve less oil contamination of the incoming charge where unleaded fuels must be used. I have only seen this cause problems. Although there are several material specifications for the standard valve range, it isn’t important to know all the gory details. They are all of reasonable quality, the later the valve type (i.e. as for A+) the better they generally are. Most of which come with chrome plated stems as standard - consequently being a little more expensive. The stems are chromed to vastly increase stem and guide life, particularly when unleaded fuel is used - more a prerequisite these days. The later valves tend to have more flow-efficient shapes too. Particularly if they are further tweaked to improve flow across the valve backs, which generally takes the simple form of a 30-degree back-cut to reduce valve seat width to a flow and longevity maximising potential of 0.060". You may have heard the term ‘two piece valve’ - especially when some vendor is engaged in flogging a race component-equipped head for road use. Basically the stem and valve head are two separate pieces, spun at great speed in opposite directions then pressed together. The friction generated causes immense heat which sticks the together - ‘fusion welding’. It is the 'joint' created that those crafty vendors work on. Myths and legends item 3 - They say that this weld/joint is a weak point and can cause the valve head to fall off, then divulge into expansive description of the catastrophic and cripplingly expensive damage this would cause. The point is correct, but they don’t give any performance levels at which this will happen. Continual, extended high engine rpm combined with high lift and very strong valve springs and missed gear changes are the killers - as can be experienced when racing. An outstandingly small number of folk using their cars purely on the road would ever get near the ‘red zone’ that causes this failure, so investing in race quality valves is a waste of money. If you don’t run the engine at or in excess of 6,500rpm constantly and for protracted periods and aren’t using a cam with vertical opening ramps (up to a Kent MD286/ Piper HR285 or similar) - good quality standard valves are up to it. Silicone/brass guides are not compulsory, but use them if it makes you happy! Chroming the stems was all the 'go' a good few years ago, mainly to allow their use in cast iron guides. The shortcoming of this was the heads used to fall off!! The chroming process leaves a ‘fatigue line’ where it stops - generally near the valve head - so needs very careful (expensive) heat treatment to relieve this. If not done absolutely correctly, the stem fractures. Instant two-piece valve syndrome and all the horrendous damage it does. 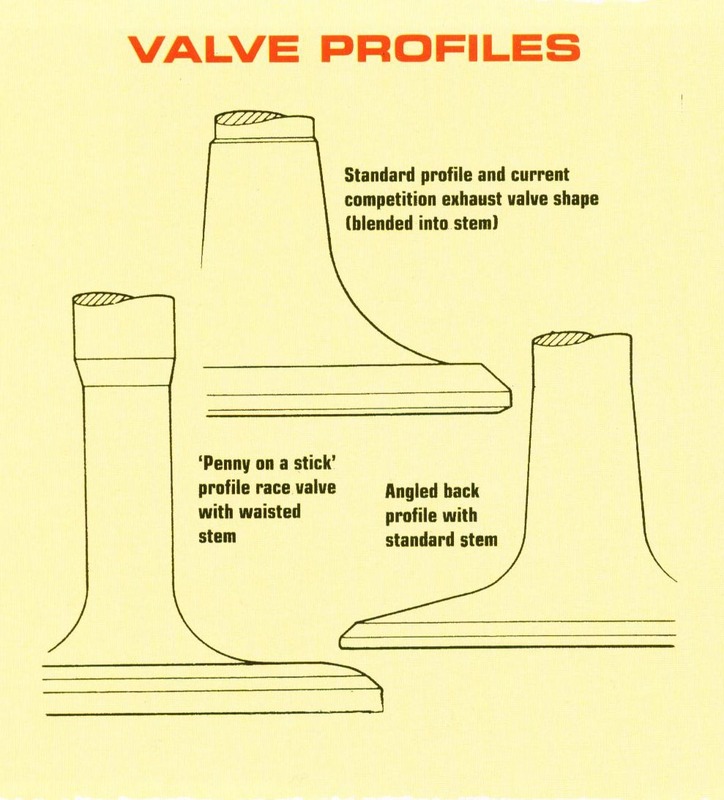 ‘Rimflo’ valves became very popular some years ago, developed by Paul Ivey of REC (Specialised Valves), and much flaunted by David Vizard. They are in essence race valves, but with specific head designs. They were described as ‘anti-reversion’ valves, inferring they flowed excellently in the right direct, whilst inhibiting flow in the wrong direction. And at the time, they certainly did what they were designed to do, particularly when installed in an otherwise standard head. Chromed stems allows their use in cast iron guides. Advances in head modifications and better understanding of the A-series peculiarities for camshaft design has seen the overall effectiveness of these valves much reduced. They are also quite a bit heavier at the valve head and more expensive than other options. Almost all current manufactured valves, be they standard or race, are suitable for unleaded fuel. If standard type valves are to be used, go for those with chromed stems. Stainless steel ones should be nitro-carburised for longevity. As for valve sizes, don’t get obsessed with size. Refer to the chart below for general guidance in this area - although this is by no means the definitive of what to use where! 33.3/29.4 Cleaned up, near standard with Std valves, iron guides, 140lb single springs. with same spec but with 35.6mm inlet valve. raised. Reworked guide bosses. guides. engines using twin SU carbs i.e. historic race. at valve throats. suspect due to little material between valves. Very difficult to maximise valve size potential. bore circuit racer (1300cc class limit). Utilising valve sizes bigger than this is complete over kill - it’s impossible to make them flow effectively although some claim it does work. Only one small-bore head represented as it is the only one currently readily available off the shelf. Three types have been used over the years. The small ‘O’ ring type as fitted to all small-bore heads, and two ‘top-hat’ types used on the large-bore engines. One of the later A+ items has a tensioner spring around the valve stem orifice to make the seal more effective and durable, so is consequently the better one. The small-bore ‘O’ ring type has me at a loss to understand how it works - other than possibly squashing away oil accumulated at the guide tops as the valve is opened and reaches full lift. Pretty useless. The top-hat seals can be used on small-bore heads even if the guides don’t have a retainer ring. I've done this hundreds of times and not had any come away from the valve guide. It certainly makes a better fist of things than those crappy 'O'-rings. It has become customary to fit seals to all valves instead of just the inlets. Fitted to the inlets they reduce oil consumption and intake charge contamination (effectively causing power loss and possible piston damage through detonation). BUT if this is done to the exhaust valves extra guide-to-valve stem clearance is necessary to prevent sticking or seizure, especially when high lift cams/rocker gear/rpm are used. Personally I prefer to run correct clearances and seals on the inlets only. Not really much to say here. The springs should be suitable for the cam/use to which the car is being put. But be warned - excessive spring pressure will cause premature valve train wear and unnecessary power loss. For road use it is highly unlikely that springs over 180lb maximum will be needed. Dual springs work better than single springs where high poundages/rates are needed; they retain more control over valve attitude and help damp some of the horrible harmonics created in the A-series valve train. As with everything there are dodgey springs about, but getting them from a main supplier should solve that problem. Myths and legends item 4. The Iskenderian (‘Isky’) springs that became ‘vogue’ and hailed as the be-all-and-end-all aren’t. They weren’t even made for the A-series engine. They were originally produced for a Ford 100E race engine, needing special or re-machined spring/top caps, as they are smaller in diameter than Mini springs. This also gives the valves mechanical advantage over the smaller diameter spring, especially where seriously big valves are used (37mm+) - so are far from ideal. They were used as they performed better than anything else at the time - and we are talking over 20 years ago now - when mega-lift cams and high lift rockers appeared on the scene. R&D and current technology has seen the rise of decent springs at sensible prices that fit with the standard caps. Those sold by MSC/MM are no exception. Talking of which, the standard caps are pretty good and certainly good enough for all but full race use or where lightness of the valve train is sought. In which case alloy, or titanium if a large bank balance is possessed, caps are the way to go. The alloy ones must be hard anodised - not just colour anodised - to make them resilient enough to withstand the battering. The ultimate steel items are those as fitted to the Cooper S - referred to as ‘W’ caps as this letter was stamped into them. They are very durable and highly recommended for all serious competition use. They really don't give much away in weight to their counter-parts and are crucially much stronger, but are generally passed over because 'fashion' and 'cred' err towards their lighter/prettier cousins. Perhaps the most controversial parts about modified heads discussed. Mostly incorrectly. And how many times have you heard/read the phrase ' modified, fully polished, ported and gas-flowed'. Talk about advertising hype/blurb! Gas-flowing IS porting and modifying. Massive ports usually flow a lot of air, but velocity will suffer. Velocity on road going engines is far more important to give half decent drivability. Not to the point of being overly small, but certainly don’t need to resemble the channel tunnel! Correctly shaped ports (from the valve seat to manifold face) of a reasonable size are far more effective than gopping huge ones of any shape. Not at all helped by many head modifiers using the manifold gaskets available as port size/shape templates! Myths and legends item 5 - biggest is not best. Unfortunately many head modifiers believe this and don’t spend time grinding where it counts. Big ports are quicker and easier to achieve than effective valve seat areas. Much of the head's performance depends on the work done around the valve seat/throat area. Detailing is critical. Done incorrectly it will negate the modified port’s effectiveness - no matter how big it’s made. The standard combustion chamber shape of the A-series is actually very good. Really good heads tend to maintain this basic shape. Wildly altered shapes rarely improve performance unless used with specific, dyno developed piston crown configurations - and these are RARE. Three angle valve seats are superior to single angle ones, but they need to be the correct angles and the seat the right width. In fact having flow-efficient valves on single-angle seats improves airflow more than 3-angle seats in the head with single-angle seat valves! Myths and legends item 6 - pencil-line-thin valve seats don't give the best over-all results. Avoid heads with anything less than a 0.050” inlet seat, 0.060" exhaust seat for road use. Even on race heads, thinner seats than these rarely prove more effective unless accompanied by very specific valve throat detailing. Apart from being detrimental to performance, they’ll wear out damn quick - especially with unleaded fuel use. Surface finish is another bone of contention. And subject to the 'eye candy' alluded to earlier. Some head modifiers spend serious amounts of time, effort and resources polishing the crap out of port and chamber surfaces. Might look good - but adds to the production costs and can seriously hurt over-all road performance. Myths and legends item 7 - Mirror-polished ports achieves absolutely nothing except - well - extreme shiny-ness. And you can’t see it once it’s bolted on. Very smooth is good. The only parts worth polishing to some degree if deemed necessary are the combustion chambers and exhaust valve throats. A fine, stone ground or abrasive tape finish on the ports (inlets particularly) is ideal for road use as it helps maximise fuel vaporisation. Very smooth will assists correctly shaped ports to maximise power outputs - particularly at higher rpm. However, mirror-polished inlet ports can cause fuel to stick to the port walls at engine speeds generally experienced on the road - which compromises vaporisation. This reduces comparative power outputs and increases fuel consumption. Anybody buying a head now, whether it’s modified or just a recon, should be getting one suitably modified to use unleaded fuel. All this entails is special exhaust valve seat inserts pressed in to the head . See article 'Cylinder head - Unleaded use' for further details. Many head modifiers are producing heads to suit the whims of customer demand rather than practical, cost-effective modifications to maximise performance for the intended application. Here we are talking whopping port sizes, mirror finish polishing, huge valves and 'race quality' components. All of which bloat the cost to the customer. And that’s YOU. You’ve done it to yourselves here folks - because it was what was necessary earlier in the life of automotive performance, it's what you - the customer - became to expect/demand. So that's what the modifiers did. Think hard about what you are REALLY going to use the car for most then get a head that suits your application done by a competent head grinder. It will save you loads of beer vouchers, and probably give better performance! Note - All modified cylinder heads now come converted for lead free as standard. For full spec on heads, see inventory. Specific application heads can be done to special order. race quality components, 35.6mm/29.5mm dia. valves. quality components, 35.6mm/29.5mm dia. valves. C-AHT55 - 1.464"/37.2mm S/Steel inlet valve, large-bore. C-AEG544 - 1.401"/35.6mm S/Steel inlet valve, large-bore. C-AEG569 - 1.311"/33.3mm S/Steel inlet valve, large-bore. C-AEG588 - 1.218"/30.9mm S/Steel inlet valve, small-bore. C-AEG107 - 1.220"/31.0mm S/Steel exhaust valve, large-bore. C-AEG106 - 1.161"/29.5mm S/Steel exhaust valve, large-bore. C-AEG587 - 1.040"/26.4mm S/Steel exhaust valve, small-bore. 0.495" lift/7,500 rpm continual use. AEA653 Steel 'W' type top caps, single groove collet only, need 8. C-AEA654 Competition inner spring locator (no step). AEA403 Standard lower inner spring locator, need 8. SS4 Set of 4 spring spacer-shims, 0.080" thick. 88G459 Single groove collet, need 8 (come in pairs). ADU4905 Valve stem seal, late 'sprung' type. AEG327 Valve stem seal 'S' type without spring.